Chiron in Aries: Do you have the will to say “yes”? See previous posts on Chiron in Aries: Chiron enters Aries, the Chiron return in Aries, Chiron in Aries: Do you have the right to say “no”? For the full picture of my unique take on Chiron, my Chiron book is where to go. 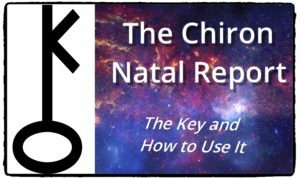 Your own Chiron Natal Report will explain yours by house, sign, and aspect, as well as transits and progressions to your Chiron and transits of Chiron to the rest of your natal chart. A YouTube playlist is also available to explain some of what I teach about this body. My basic take on Chiron is that it is the energy antenna within a person’s psyche. The wounding and healing associated with it seem to be responses and reactions to sensing energy and emotion in others and in the world around us. As Chiron makes us hypersensitive to how others react to us, there is often quite a lot of editing of behavior when it comes to this minor planet. We fear rejection when Chiron’s involved, perhaps even expecting it. Sometimes we wonder if we’re worth loving and supporting. We’ll be attuned to how others seem to respond to us and, often, make mountains out of mole hills, fearing that we’ve overstepped the line if they are anything but happy with what we said or did. With Chiron in Aries, the sign of assertion, defense, and expressing desire, we have a special task of learning about boundaries. I define them as about saying “yes” to what we like and “no” to what we don’t like. A person with this natal placement may feel profound rejection when others say “no” to him or her. And this can affect his or her willingness to say “yes” when he or she means it. As Chiron entered Aries in 2018 and is returning there soon (after retrograding to Pisces for a few months), collectively we are being asked to explore how willing we are to say “yes” to what we want. Inherent in expressing desire is a fear of being rebuffed, rebuked, or denied. A main lesson of Chiron in transit is to expose us to the ins and outs of vulnerability, and this is a life-long feature of living for those with the Centaur natally in Aries. And so what if someone says “no” to you? (They will, at least sometimes.) What if it hurts? (It will, at least sometimes.) So, will you let the reality that people sometimes/often/half the time say “no” stop you from going for what you want? Will you deny your sparks because sometimes they don’t go anywhere? In my mind, this transit for the collective asks us to learn more about the truth that we are vulnerable when it comes to desire. We all take a risk when we go for what we want. Its time in Aries can reveal that the nature of desire can make us vulnerable to rejection. This can teach us to be sensitive to each other when we want and need things with and from each other, improving communication as well as respect between us. A planet working through the lens of Aries seeks to develop the courage to be willful. Chiron here can show us more about the human side of things, ultimately giving a new sort of chance to navigate interpersonal relationships and everything else with more openness to the human reality behind our choices and behaviors. And, ideally, this changes how we approach competition and conflict, which has implications for so much going on in our world. You have vulnerability when it comes to what you want and need, and so do others. Can you let a recognition of your shared vulnerability mature and evolve the conversation, bringing more human understanding in? As this is a process many may need to learn, be aware of hearts on sleeves when it comes to desire, competition, and conflict. Look out for–and have compassion for–the human vulnerability behind a demand, an expectation, an assertion of desire or need. If you have Chiron in Aries in your birth chart, check any patterns you may have developed over decades of not asserting what you want, or being crushed when you express it and others say “no”. Realize that your task when it comes to Chiron is to learn to say “yes” with will, yes, but a will grounded in an acceptance of the vulnerability that makes and keeps you human.